Speedliner provides a thick, incredibly tough, hard rubber/polymer coating for applications on new bare metal, wood, fiberglass and prepainted metal surfaces. Speedliner has been proven to be the best underbody protection for custom cars and hot rods with a choice of custom colours. Any painted or bare metal, aluminium, wood, concrete or fiberglass surface that needs protection from abrasion and/or corrosion together with a durable non-slip application, is an ideal candidate for Speedliner. Speedliner is proven to be the toughest and most durable spray on liner. Speedliner offers the most UV protection available. This means your vehicle will keep its quality colour over time. 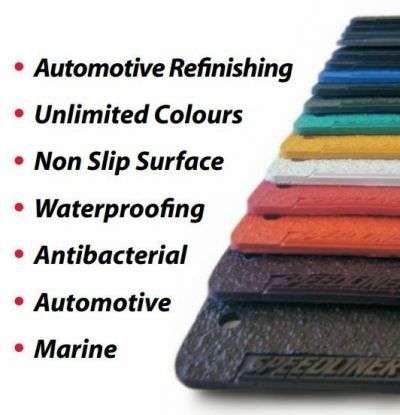 Speedliner offers a variety of high-quality automotive colour’s to complement or contrast. Speedliner HC is another variance of Speedliner. The HC stands for Hygiene Coating and is for use as an anti-bacterial coating for food vans and in factories and vet clinics etc. It has been approved for use in the dairy and meat industry. Speedliner can utilise the high tech fiber of Kevlar to make it stronger than ever. The same fiber the military uses to manufacture bullet resistant vests and armoured vehicles we use to provide extraordinary tensile strength (4,200 psi) and tear strength (610 lbs./in.). Speedliner’s unique textured surface keeps your cargo from slipping, and you’ll have the satisfaction of knowing that Speedliner’s non-slip surface prevents damage to both your ute’s deck and its content. The Air-tight, contour fit permanently seals and guards from dirt, water and chemicals that cause rust and corrosion. Speedliner, quietens rattles and squeaks by dampening vibrations originating from the deck of the truck. This gives the driver and passengers a quieter ride.